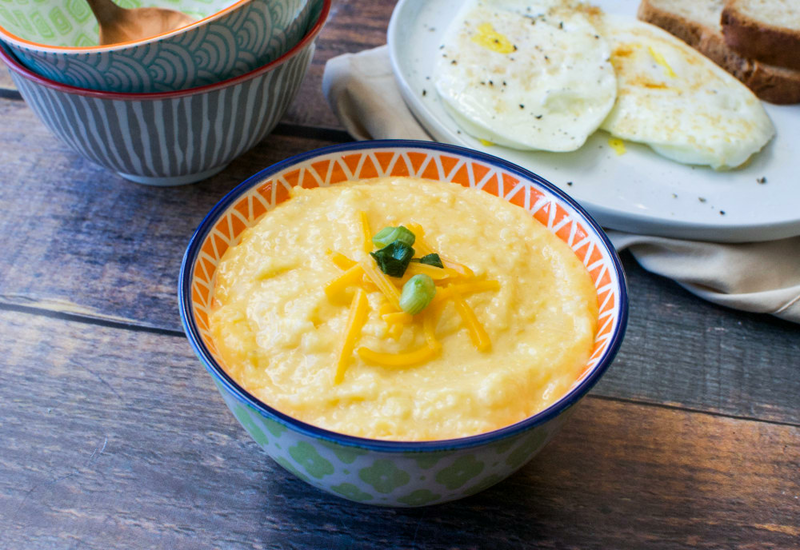 These creamy Cheddar grits are the perfect addition to any meal—whether lunch, brunch or dinner! They pair well with sautéed shrimp, or make a classic breakfast side with sausage and eggs. Similar to polenta, grits were once a humble cornmeal dish that's grown in popularity in recent years thanks to the irresistible savory taste and texture and inexpensive price tag. But unlike polenta, grits don't require constant stirring, making them easier to prepare. Don't skimp on the cheddar—the grated cheese helps create a luscious texture and adds salt and flavor. Add whatever toppings you like! Cheese is traditional, but try chopped chives, crumbled bacon, or a vinegary hot sauce like Tabasco. Some also like their grits sweet, similar to porridge—to try that, omit the cheese, and drizzle the cooked grits with maple or sorghum syrup. Per Serving: 332 calories; 26g fat; 8.7g carbohydrates; 15g protein; 77mg cholesterol; 1098mg sodium. Really delicious creamy grits! Half and half is a little lighter than heavy cream, but still adds a delicious texture. These are so good, I love the cheese! Definitely a cheat day breakfast, and very savory. These creamy cheddar grits are really good. This recipe makes a large batch so I ate it for breakfast, lunch, and dinner. It goes great with sausage and eggs, or shrimp and as well. Grits are not part of my childhood, so my only experience with them is from the one time that I ordered it from Cracker Barrel. I was not a fan. Fallowed the recipe completely. These are amazing! Yummy.